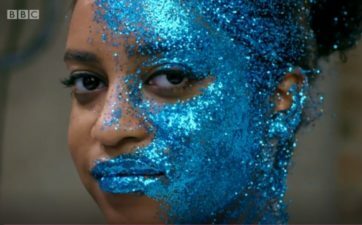 Bioglitter features on the BBC! We’ve been waiting a while to tell you all but last week, our Bioglitter® featured on BBC3 programme, Glow Up! For those of you that don’t know, Glow Up is a competition series which sees 10 aspiring make-up artists battle to be named Britain’s next make-up star. Tested in a range of real-world professional assignments, each week the two weakest MUAs enter the elimination face-off, with series judges Val Garland, LOREAL Paris global makeup director and Dominic Skinner, senior artist for Mac Cosmetics deciding who will go home. Featuring in episode two, it was in fact Val who used our eco-friendly Bioglitter® as she wanted the budding artists to be more spontaneous as part of the decider task! Just check out the pictures! Stay tuned for more episodes and keep your eyes peeled for Bioglitter®.